Make sure your trip to The Loop, Chicago is one you'll never forget! We've pulled together tons of information for you to look through to plan out your ideal getaway to The Loop. We found 452 places for you to stay in all different price ranges.We also have 62 attractions in The Loop that you don't want to miss, and activities for your trip so you can experience something new every day. When it comes to finding hotels in The Loop, an Orbitz specialist can help you find the property right for you. Chat live or call 1-800-454-3743 any time for help booking your hotels in Longwood. Our team of experts can help you pinpoint The Loop hotels options suited to your tastes and budget. On Orbitz, The Loop hotel deals mean flexibility. If you need to change your The Loop hotel reservations, or cancel your stay, Orbitz doesn't charge cancel or change fees. Orbitz also offers a great selection on airline tickets, vacation packages, and car rental deals to so you can plan your trip to The Loop all in one place. Bring your friends and family, or take a solo vacation to soak up all that The Loop, Chicago has to offer. Happy Travels! Freehand Chicago has 3.50 stars, is located in the The Loop area of Chicago, and offers free wifi. Inn of Chicago has 3.00 stars, is located in the The Loop area of Chicago, and offers free wifi. Swissotel - Chicago has 4.50 stars, is located in the The Loop area of Chicago, and offers free wifi. Hotel Lincoln has 4.00 stars, is located in the The Loop area of Chicago, and offers free wifi. Are there hotels in The Loop with free breakfast? Chicago South Loop Hotel has a 3.00 star rating. Hyatt Place Chicago/River North has a 3.00 star rating. Loews Chicago O'Hare Hotel has a 4.50 star rating. Hilton Chicago O'Hare Airport has a 4.00 star rating. Do hotels in The Loop allow pets? Don't want to leave your furry friend at home alone while on your trip to The Loop, Chicago? There are 166 hotels in The Loop that allow pets! We understand that most trips are much more fun when you can bring along man's best friend. Here are some of the best hotels in The Loop that allow pets. Hotel Felix Chicago: A 4.00 star, pet-friendly hotel. Omni Chicago Suites - Magnificent Mile: A 4.50 star, pet-friendly hotel. Loews Chicago Hotel: A 4.50 star, pet-friendly hotel. Virgin Hotels Chicago: A 4.50 star, pet-friendly hotel. Are there any The Loop hotels with restaurants? Yes, 170, to be exact! Sometimes, on vacation, you just don't want to leave the hotel. Relax and unwind without having to plan out meals when you book your stay at a hotel in The Loop that has a restaurant. Check out our best deals on hotels in The Loop, Chicago with restaurants. Kimpton Hotel Palomar Chicago: Located in The Loop, Chicago. 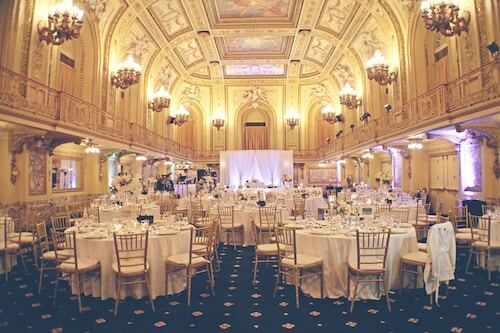 Palmer House a Hilton Hotel: Located in The Loop, Chicago. Hard Rock Hotel Chicago: Located in The Loop, Chicago. DoubleTree by Hilton Chicago - Magnificent Mile: Located in The Loop, Chicago. What are the best The Loop, Chicago hotels with pools? Whether you're visiting The Loop during the summer months and want a quick way to cool off, or if you like to swim a few laps to start your day, our The Loop, Chicago hotels with pools are the perfect place to stay on your next trip. Check out our best deals on hotels in The Loop, Chicago that have pools. Hilton Chicago- Michigan Ave Cultural Mile has a swimming pool for guests. The James Chicago-Magnificent Mile has a swimming pool for guests. Sheraton Grand Chicago has a swimming pool for guests. Embassy Suites Chicago Downtown Magnificent Mile has a swimming pool for guests. Where can I find hotels in The Loop with guest parking? Wyndham Grand Chicago Riverfront is a hotel in The Loop, Chicago with a 4.00-star rating. Millennium Knickerbocker Chicago is a hotel in The Loop, Chicago with a 4.00-star rating. InterContinental Chicago Magnificent Mile is a hotel in The Loop, Chicago with a 4.50-star rating. Hyatt Centric The Loop Chicago is a hotel in The Loop, Chicago with a 4.00-star rating. Are there The Loop, Chicago hotels with 24-hour concierge service? Planning a late arrival to The Loop? No worries! At Orbitz, we know that travel is stressful enough as it is. The last thing you need to worry about is traveling all the way to Chicago only to miss check-in hours at your The Loop hotel. Travel can be unpredictable, book our The Loop hotels with 24-hour concierge service to stay on the safe side. Hyatt Regency McCormick Place is located in The Loop, Chicago and offers concierge services 24 hours a day. This hotel has a 4.00 star rating. Hyatt Centric The Loop Chicago is located in The Loop, Chicago and offers concierge services 24 hours a day. This hotel has a 4.00 star rating. The Langham- Chicago is located in The Loop, Chicago and offers concierge services 24 hours a day. This hotel has a 5.00 star rating. The Talbott Hotel is located in The Loop, Chicago and offers concierge services 24 hours a day. This hotel has a 4.00 star rating. Where can I find hotels in The Loop with non-smoking rooms? You've come to the right place! We understand that sometimes you can't stand the smell of smoke in your hotel room. Book one of our hotels in The Loop that offers non-smoking options for your room. Make sure you get a good night's sleep without smelling of smoke after you leave. Check out our deals on hotels in The Loop, Chicago that have non-smoking options. Ambassador Chicago in The Loop offers non-smoking rooms. This hotel has a 4.00-star rating. Fairmont Chicago at Millennium Park in The Loop offers non-smoking rooms. This hotel has a 4.50-star rating. Sofitel Chicago Magnificent Mile in The Loop offers non-smoking rooms. This hotel has a 4.50-star rating. Warwick Allerton - Chicago in The Loop offers non-smoking rooms. This hotel has a 4.00-star rating. What are the best 5-star hotel deals in The Loop, Chicago? Want somewhere a little more upscale for your stay in The Loop, Chicago? Our The Loop 5 star hotel properties have everything you'll want for a luxurious The Loop getaway. Trump International Hotel & Tower Chicago is a 5-star hotel in The Loop. The Langham- Chicago is a 5-star hotel in The Loop. What are some deals on 4-star hotels in The Loop, Chicago? Hyatt Regency Chicago Reservations: This Magnificent Mile hotel is located among Chicago's world-class shopping, restaurants and attractions. The Navy Pier, Millennium Park and Art Institute are less than a mile away. Hard Rock Hotel Chicago Reservations: On Michigan Avenue and across from Millennium Park, this rock-inspired hotel occupies the 36-story, Art Deco-style Carbide and Carbon Building in downtown's Loop; Macy's is a block away. Palmer House a Hilton Hotel Reservations: This 1925 Beaux Arts-style Chicago hotel is steps from Millennium Park, 2 blocks from Macy's and the Art Institute, and 1 mile from Lake Michigan, Magnificent Mile shopping, and Wrigley Tower. Warwick Allerton - Chicago Reservations: Located on Michigan Avenue in the middle of Chicago&#39;s Magnificent Mile, this 1920s Italian Renaissance hotel is surrounded by fashionable shops, 1 mile from Lake Michigan and the Art Institute. What are some great 3-star hotels in The Loop, Chicago? If you're in the market for a budget-friendly hotel in The Loop, Chicago, we've got some great news for you. The Loop 3-star hotel bookings just got easier (and cheaper!) with these hotel deals from Orbitz. Check out these awesome and available 3-star hotels in The Loop. Book Congress Plaza Hotel: Built in 1893, this downtown Chicago hotel offers a convenient location across from Grant Park and close to Lake Michigan. Book DoubleTree by Hilton Chicago - Magnificent Mile: Located in the northern part of downtown, Doubletree Chicago Magnificent Mile is 2 blocks from Magnificent Mile shopping and dining, 3 blocks from Lake Michigan, and 5 blocks from Navy Pier amusements. Book Inn of Chicago: Inn of Chicago is a half-block from the Magnificent Mile and 2 blocks from the landmark Tribune Tower. Millennium Park, Navy Pier, and the Art Institute of Chicago are among the many attractions within 1 mile. 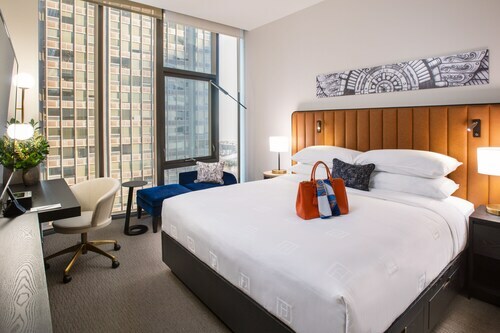 Book Chicago South Loop Hotel: Located in South Loop, this spa hotel is within 1 mi (2 km) of Illinois Institute of Technology and McCormick Place. US Cellular Field and Soldier Field are also within 2 mi (3 km). What are the top must-see The Loop sights? The Loop, Chicago is full of exciting places to visit and beautiful sights to see. Explore all the neighborhood has to offer when you book a hotel close to the attractions at the top of your list. With 62 sights to choose from, hopefully you'll have enough to go see and keep you from getting bored while in Chicago! Check out some of our favorite sights to see in the The Loop area of Chicago below. Great location in Chicago. Rooms were super clean and was comfortable. They provide bottle water, but you have to grab it from the front desk. But, like all of Chicago, parking was either expensive or non-existent. But, highly recommend.